Phoebe’s nest is brimming with teeny-tiny hummingbird chicks, and there's a handy-dandy webcam set up for all the world to watch. April 9, 2014, 1:05 p.m.
What is it about hummingbirds? They are the stuff of pixie worlds and magic, flitting about in flashes of jewel tones and iridescence. If Tinker Bell had a spiritual animal, it would surely be the hummingbird. Hummingbirds can fly right, left, up, down, backwards, and even upside down; and they do that while flapping their wee wings at a remarkable rate of up to 80 beats per second. While this enables them to meet their prodigious nectar and insect intake requirements, it also leaves us poor hummingbird lovers with little more to enjoy than a fly-by flicker of color and an audible, dive-bombing whiz. 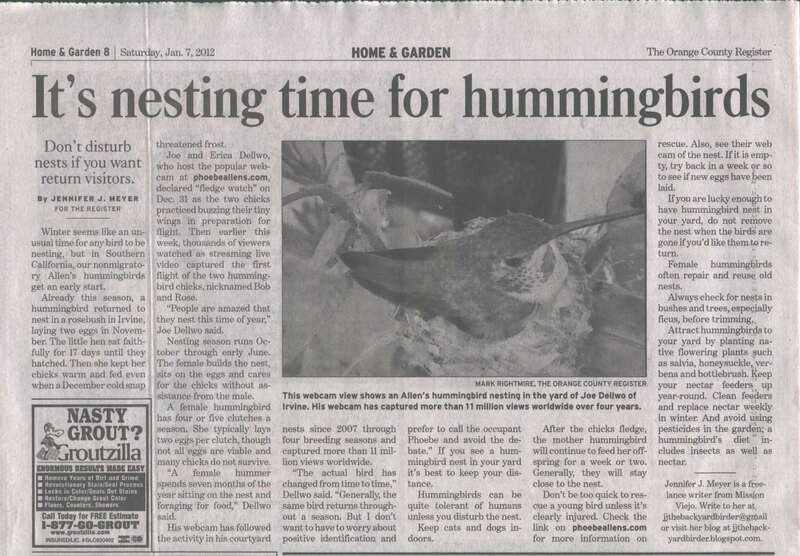 Fortunately, to the delight of armchair hummingbirders everywhere, Southern California residents Joe and Erica Dellwo have a garden that a Channel Islands Allen's hummingbird – who goes by the name of Phoebe – calls home. And even more fortunate is that the Dellwos have set up a webcam to chronicle the antics of this lovely Lilliputian lady as she returns each nesting season to take care of her hummingbird business. In her golf-ball sized nest nestled in a rose bush, Phoebe dutifully lays her eggs, usually producing four to five clutches per season, two eggs per clutch. The teeny birds hatch after 17 days, and are generally flying within a month; at which point, Phoebe tackles her empty nest syndrome by building a new nest or repairing the old one and then getting to work on a new clutch. Bless her itty-bitty heart … and its 1,260 beats per minute.